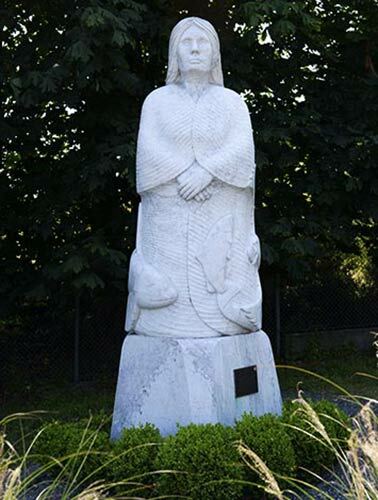 Designed and Carved in 1999. 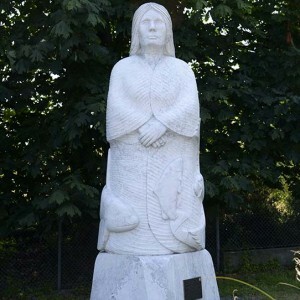 The marble sculpture represents a mystic Native princess, her robe adorned with the wildlife of Vancouver Island. An orca dives from her hair, an eagle soars interconnected with a salmon leaping upwards. The upper half of the sculpture depicts the quiet calm of the earth, while the lower portion depicts the world in action. The princess represents the Earth, the lifegiver, the source of our livelihood. She is stone – marble, transcending thousands of years of pressure and heat, to be transformed again.